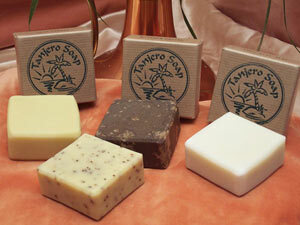 Welcome to the Tanjero website, where you can read a bit about our company and browse through our selection of hempseed oil soaps, all of which are suitable for vegans. There are no unnecessary chemicals - this is a sodium lauryl sulfate-free zone! We have now installed a shopping cart and are happy to take orders direct from this, by email or by post. We will be adding more information to the site soon, so don't forget to come back and visit us again later. Please email us if you would like to be kept updated with new lines and special offers - we are on a continuing mission to produce an increasing range of lovely soaps that add to the pleasure of your bathing.